Our Festival Services are brimming with prayers and melodies heard only this time of year. Our members have been preparing to chant Torah and Haftorah in honour of this time of celebrated our freedom. 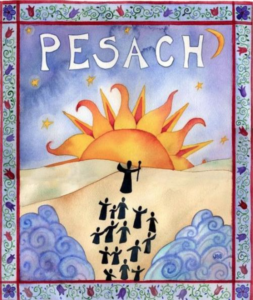 Led by Rabbi Cohen & Cantor Baruch in our main sanctuary. Delicious Kiddish Luncheon follows the service. 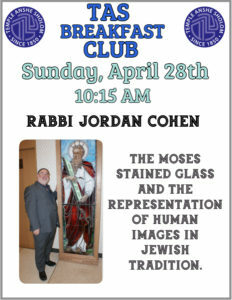 Our Spring Series of Breakfast Club returns on Sunday, April 28th with a delicious breakfast for $10 and engaging presentations on a wide range of topics. 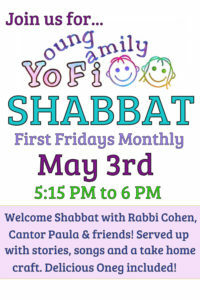 YOFI Shabbat is especially for families with young children to experience Shabbat with stories, songs and games together with Rabbi Cohen and Cantor Paula. Enjoy a delicious and healthy Oneg and take home a craft to do together as a family. YOFI bear looks forward to singing with you!